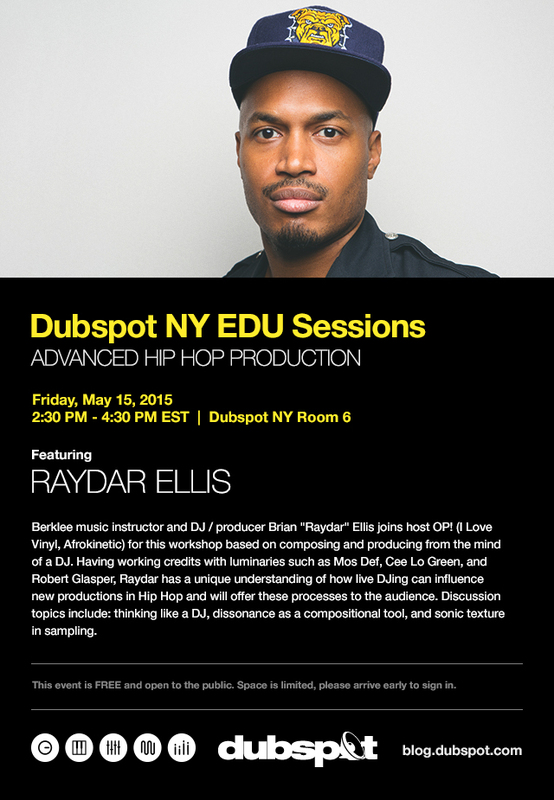 Dubspot NY EDU Sessions (5/15) Advanced Hip Hop Production w/ Raydar Ellis + OP! On Friday May 15th, Dubspot NY EDU Sessions continue with host OP! and special guest Raydar Ellis, Hip Hop Music instructor at Berklee College of Music for a free DJ focused advanced Hip Hop production workshop. Composing from the mind of a DJ: How do you go from two records in a 10-second blend to a brand new beat? Dissonance as a compositional tool: Chords and notes clashing in Hip Hop that makes it work. Sonic Texture: How to work with a melody on a record; sample it or replay it. Born to a middle-class family in White Plains, NY, Brian Ellis spent most of his life in New Jersey and Connecticut (where he moved right before high school). It was in Connecticut that he first began to get interested in hip-hop, writing rhymes constantly and working on beats as often as he could. Nicknamed “Raydar” by his friends because of his habit of researching and tracking down information, Ellis enrolled in North Carolina A&T State University in order to study electrical engineering. While there, he started the Short Bus Crew with fellow hip-hoppers and friends, but after two yearsEllis decided he wanted to pursue music more seriously, and transferred to Berklee in Boston to study music synthesis and business, as well as to continue making beats and writing rhymes. As part of the group Hood Official, Ellis performed at the 2005 NBA All-Star Game concert, releasing his debut, Late Pass, on Boston-based Brick Records in 2006, after which he moved to Atlanta to continue collaborating with the Short Bus Alumni.